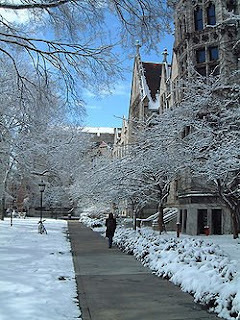 The University of Chicago is a private university located principally in the Hyde Park neighborhood of Chicago. Founded in 1890 by the American Baptist Education Society and the oil magnate John D. Rockefeller, the University of Chicago held its first classes on October 1, 1892, and was a founding member of the Big Ten Conference. Chicago was one of the first universities in the country to be conceived as a combination of the American interdisciplinary liberal arts college and the German research university. Affiliated with 81 Nobel Prize laureates, the University of Chicago is widely regarded as one of the world's foremost universities. 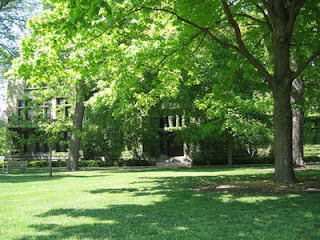 Historically, the university is noted for the unique undergraduate core curriculum pioneered by Robert Maynard Hutchins in the 1930s, and for influential academic movements such as the Chicago School of Economics, the Chicago School of Sociology, the Chicago School of Literary Criticism, and the law and economics movement in legal analysis. The University of Chicago was the site of the world's first man-made self-sustaining nuclear reaction. It is also home to the largest university press in the United States. The University of Chicago is principally located seven miles (11 km) south of downtown Chicago, in the Hyde Park and Woodlawn neighborhoods. 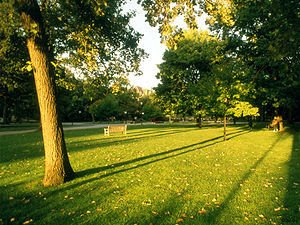 The campus is bisected by Frederick Law Olmsted's Midway Plaisance, a large linear park created for the 1893 World's Fair. While the bulk of the campus is located north of the Midway, some of the professional schools are located south of the Midway. The quadrangles of the main campus feature a botanical garden and neo-Gothic buildings constructed mostly out of limestone in the late 19th century. The tallest building is Rockefeller Chapel, designed by Bertram Goodhue. Buildings of the original quadrangles were deliberately patterned after the layouts of Oxford University and Cambridge University. Mitchell Tower, for example, is a smaller-sized reproduction of Oxford's Magdalen Tower, and the University Commons, Hutchinson Hall, is a duplicate of Oxford's Christ Church Hall. Contemporary buildings have attempted to complement the style of the original architecture. Notable examples include the Laird Bell Law Quadrangle by Eero Saarinen, the School of Social Service Administration by Ludwig Mies van der Rohe, and the Robie House by Frank Lloyd Wright. The largest modern addition is the Regenstein Library, designed by architect Walter Netsch and constructed on the grounds of the former Stagg Field, the site of the world's first nuclear reaction. 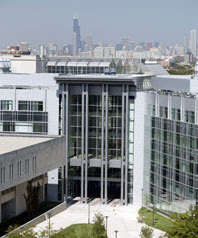 The University of Chicago also maintains a number of facilities apart from its main campus. The university's Graduate School of Business maintains campuses in Singapore, London and in downtown Chicago, while the Paris Center, a campus located on the left bank of the River Seine in Paris, hosts various undergraduate and graduate study programs. The university's Yerkes Observatory, constructed in 1897 and located in Williams Bay, Wisconsin, is home to the largest refracting telescope ever built. Although Yerkes was never able to match the observation conditions afforded by the mountaintop location of its main competitor, the Lick Observatory, the telescope was a leader in astrophysics. Yerkes was the first telescope to determine the spiral structure of the Milky Way Galaxy and the first to observe carbon in stellar spectra. The University of Chicago campus is also home to the Oriental Institute, an internationally renowned archeology museum and research center for ancient Near Eastern studies. The Institute is housed in an unusual Gothic and Art Deco building designed by the architectural firm Mayers Murray & Phillip. The Museum has artifacts from digs in Egypt, Israel, Syria, Turkey, Iraq, and Iran. Notable possessions include the famous Megiddo Ivories, various treasures from Persepolis, the old Persian capital, a 40-ton human-headed winged lamassu from Khorsabad, the capital of Sargon II, and a monumental statue of King Tutankhamun. Across the street from the Oriental Institute is the Seminary Co-op bookstore, located in the basement of the Chicago Theological Seminary. The Co-op stocks the largest selection of academic volumes in the United States. The University of Chicago's economics department is particularly well-known. In fact, an entire school of thought (the Chicago School of Economics) bears its name. Led by Nobel Prize laureates such as Milton Friedman, Ronald Coase, George Stigler, Gary Becker, Robert Lucas, James Heckman, and Robert Fogel, the university's economics department has played an important role in shaping ideas about the free market. The Chicago School of Economics is also famous for applying economic principles to every aspect of human life, as famously demonstrated by University of Chicago Professor Steven Levitt in his best-selling book, Freakonomics. The university is also known for creating the first sociology department in the United States, which later gave birth to the Chicago School of Sociology. Scholars affiliated with this school are considered pioneers in the field and include Albion Small, George Herbert Mead, Robert E. Park, W. I. Thomas, and Ernest Burgess. The university is home to several committees for interdisciplinary scholarship, the most famous of which is the Committee on Social Thought. One of several Ph.D-granting committees at the university, it was started in 1941 by University of Chicago president Robert Maynard Hutchins along with historian John U. Nef, economist Frank Knight, and anthropologist Robert Redfield. The committee is interdisciplinary, but it is not centered on any specific topic. Since its inception, the committee has drawn together noted academics and writers to "foster awareness of the permanent questions at the origin of all learned inquiry". Members of the committee have included Hannah Arendt, T. S. Eliot, David Grene, Leo Strauss, Allan Bloom, Friedrich von Hayek, Leon Kass, Mark Strand, Wayne Booth, Joseph Rutherford Hicks, and J.M. Coetzee. 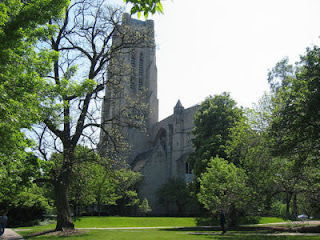 In 1983, the University of Chicago implemented the University of Chicago School Mathematics Project, a comprehensive mathematics program for students from kindergarten through twelfth grade. Today, an estimated 3.5 to 4 million students in elementary and secondary schools in every state and virtually every major urban area are now using UCSMP materials. The side bar on the right lists "Chicago University", rather than "The University of Chicago". This is incorrect and may lead to confusion with Chicago State University. Please correct. Otherwise a very interesting and informative page. Well done. A Univ of Chicago grad.